It was always a dream of mine to study abroad, travel and meet new people. Growing up watching American shows and movies, I was able to vicariously experience the American lifestyle, but wanted to live it for real. The U.S., therefore, was a top destination for me when I first started thinking about my higher education. While exploring different universities and programs, I was focused on not only a strong economics foundation, but also a multidisciplinary facet in terms of a quantitative and international focus. When I stumbled upon the UC San Diego School of Global Policy and Strategy’s (GPS) flagship program, the MIA, and combed through its details, I knew I had found my pit stop. This was the program that perfectly fit my criteria. I definitely was not mistaken when I attended my first few classes. I was completely mesmerized by the way the classes were taught—the emphasis on connecting theory to the practical world and the encouragement of class discussion. The best part about the academic environment here is the top-notch faculty who all are involved in high-impact research. Their experience and knowledge is what makes the learning so much more interesting and exciting. The curriculum here is rigorous but extremely rewarding, too. The hard skills one learns in terms of statistical software such as STATA and R and coursework in finance, policymaking and business management is very useful both in terms of career and personal development. Some of my favorite classes are in the Quantitative Methods series, particularly the class on STATA. Using STATA, I have analyzed the Kuznets curve phenomenon in China and health indicators in India, which has helped sharpen my data analysis skills and ability to work with large data sets. However, the foremost thing that strikes me about GPS is the blend of cultures from all across the world. With about 50 percent of the class being international, comprising people from all walks of life, it is extremely enriching to interact with them and learn about their experiences. Being the only Indian, I also am a part of this engagement, and I try to share my cultural experiences with my peers. I love the sense of community at GPS, as well. Everyone is so involved in different student organizations apart from academics. We have strong cultural organizations such as Southeast Asia Link, China Focus and Latin American Student Organization, among others to foster cultural learning at the School. We also have academic- and career-oriented organizations such as Development Club and Net Impact that organize guest speakers from different fields in development and energy to come talk to students about their experiences and provide guidance. Our Career Services team is one of the best, with such passionate and loving people. They work tirelessly year-round to give us leads in jobs and internships and respond to our emails quickly and efficiently. They are a true asset to the School. I am glad to be a part of this beautiful school with some of the smartest and most talented people I have ever come across. The sense of collaboration and togetherness here is unparalleled. Coming from a country far away from the U.S., I safely can say I have found a home in a foreign land. GPS students nominate one another to contribute to this series. 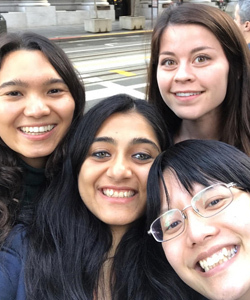 Read “Why GPS: Going beyond expectations,” authored by Dana Kozhakhmetova, 2018 MIA candidate, who tagged Jain to write this excerpt.